LIVERPOOL have a new team mascot. He’s Mighty Red. 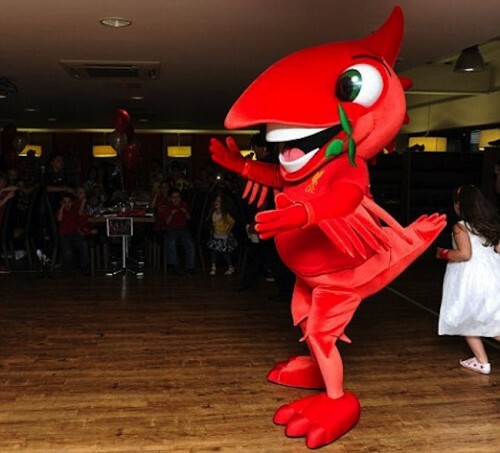 Legend has it that Mighty Red is a massive sunburnt Liver bird. Others say he’s a demented puffin who nods to Liverpool great Phil Thompson and smiles at Emelyn Hughes. The velour-coated bird is sure to be a hit at Anfield. Already he’s wowing the kids. That’s one scary mascot if it can smile at dead people. Just what England needs, more American style mascots. There is only one worthy mascot. Mr. Met. I just figured out a big part of why he’s so freaky… a beak AND teeth… Imagine if you will a world with seagulls flying around your chips, gnashing their chompers at you. Or a mighty eagle coming down from the skies to lift your beloved pet dog Rover away with his sizeable incisors. Terrifying. Words fail me ! ……Tacky perhaps. Put it in a purple kit and shoot me. Changy the Elephant could take the Mighty Red in a fight any day.